When you think about it, what’s cooler than being named to a Who’s Who list in the world of digital identities? One World Identity, an independent identity research and strategy company that specializes in cybersecurity, digital commerce, and risk management, published its roster of the Top 100 Influencers in Identity this week. 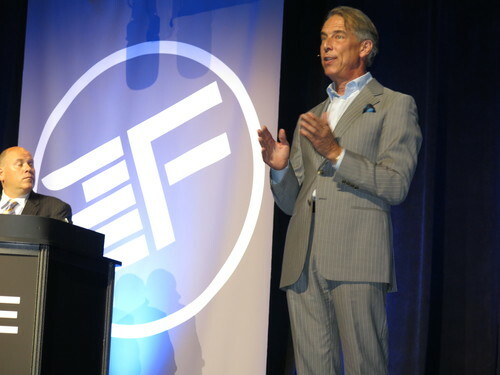 This year, 20 Finovate alums made the cut. The individual influencers – as well as the companies they work for- are listed below. As with last year’s roster, this year’s list was compiled by taking nominations submitted via Twitter, LinkedIn, and at oneworldidentity.com. The staff and advisory council for One World Identity whittled down the initial list of more than 1,000 nominees to a final 100. One World Identity began as a project from a group of Google employees back in 2015. The company was officially launched the following year as a way to help spur innovation and collaboration in the field of digital identities. Travis Jarae is founder and CEO. BankNxt’s BIGcast interviews CEO Steve Hoffman of SayPay Technologies. Algomi partners with IPC Systems to support buy-side users of its Honeycomb network. Bank Innovation takes a look at CBANC and its effort to make social media work for banks. MIT adopts Ripple validator to advance consensus and blockchain research. CIOReview names Praesidio in list of top 20 Most Promising Banking Technology Solution Providers for 2016. What happens when you combine a biometric ID-authentication specialist with an innovator in the field of electronic checks? The partnership means AuthenticID’s CatfishAIR ID-authentication technology will be integrated into MyECheck’s mobile payment solution, MyEPay. This includes AuthenticID’s check imaging technology, as well. AuthenticID’s biometric authentication works by combining Automated Forensic Document Authentication (AFDA) and a Facial Recognition Engine (FRE). Consumers take a selfie-style picture of themselves with their mobile phone, which is then compared to a photo of the consumer that is on the official ID document such as that on a driver’s license or passport. An alum of both FinovateSpring and FinovateFall in 2013, AuthenticID was founded in January 2012 and is headquartered in Atlanta, Georgia. Feedzai releases API updates to its fraud detection technology. Bank of the West adds Snap-to-Pay functionality from Fiserv to its mobile banking app. authenticID partners with Sionic Mobile to bring catfishAir to ION Rewards and ShopGive consumer apps. Azimo expands its online money transfer service to Romania. Fastacash teams up with Visa Europe, enabling P2P payments via social network for users of Visa Direct. Finovate Debuts: InvestUp Launches UK Crowdfunding Supermarket. PYMNTS looks inside MasterCard’s Masters of Code Hackathon. ProfitStars launches EPS SmartPay Express to enable FIs to provide online payment and donation services for business customers. Tradier integrates with AbleSys’ AbleTrend. PayPal and eBay prepare for breakup later this year. Boku launches phone-on-file technology to remove friction from online transactions. TransferWise marks US launch with #nothing2hide semi-naked march through New York financial district. Fintech Finance’s video production showcases FinovateEurope 2015 action. FinovateEurope: Behind the Scenes with CRIF, Mobino, and SaaS Markets. United Bank Limited picks VoiceTrust for voice biometrics. InComm partners with Asia-based Money Online to launch POS-activated gift card mall solutions in Southeast Asia. Rezzcard to integrate with InComm’s Cashtie to enable Rezzcard cardholders to pay their rent in cash at over 70,000 retail locations. American Banker reports: Western Union to use NICE Customer Analytics. Come see its new tech at FinovateSpring. Xero reaches 100,000 paying customers in Australia. Check out an interview with BRIDGEi2i Director and Co-Founder, Ashish Sharma. SecondMarket considering U.S.-based bitcoin exchange. Live Gamer customers to get access to MasterCard’s MasterPass digital payment service. authenticID enhances ID proofing technology to help combat cloned credit card fraud. Green Dot wins top honors in four categories at 2014 Paybefore awards. Global Banking & Finance Review takes a look at Kalixa Group’s American expansion. authenticID has announced new enhancements to its CatfishID identity proofing solution that make it even harder for fraudsters to use cloned credit cards. 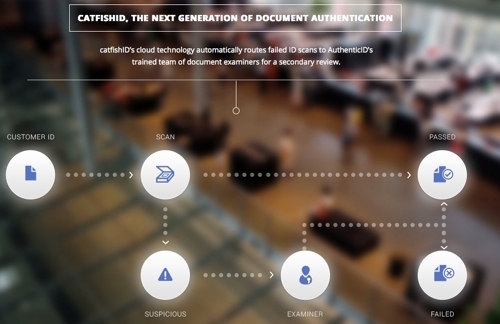 CatfishID combines authenticID’s sizable library of government-issued identification cards with techniques to verify micro prints, read bar code and magnetic stripe data, and make front-to-back card data comparisons. This provides an additional layer of verification that makes once major source of credit card fraud – cloned cards – that much more difficult to pull off. This technology – automated forensic document authentication (AFDA) – is not new, according to the company. But what is innovative is the way authenticID is deploying the technology to the specific task of detecting fraudulent or counterfeit identification. Learn more about CatfishID here. Based in Atlanta, Georgia, authenticID was founded in 2012. 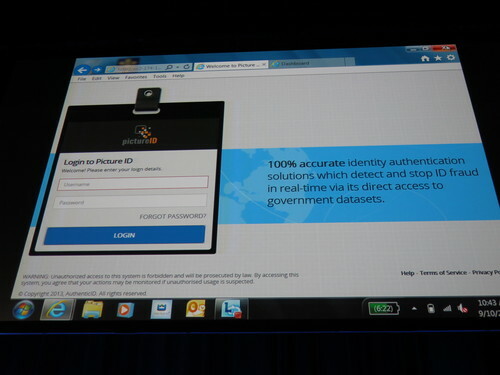 The company demoed its PictureID technology as part of the FinovateFall 2013 show in New York. Our next presenter is authenticID, demoing their identity proofing solution, pictureID. “authenticID’s identity authentication solution, pictureID annihilates ID fraud. It is the only system that’s invulnerable to fraud schemes. Our unique agreements allow pictureID to connect directly with document issuers in the U.S. and Canada. This allows companies to go directly to the source for identity authentication. Metrics: Over $1M pledged; installed in nuclear facilities, either in or starting proof of concept with a major U.S. telecom, retailer, and a top 5 bank. Product distribution strategy: Direct to Business (B2B) & through other fintech companies and platforms. The full demo video will be available at Finovate.com in mid-September.